With a selection (or multiple selections) from each of those categories, you will have lenses with a great range of focal lengths for your landscape needs. Landscape photography can make use of all focal length lens currently offered, from fisheye to 800mm. The ultra-wide angle lenses will allow you to emphasize a foreground subject against an all-in-focus large scene, the telephoto lenses will keep distant subjects large in the frame and the general purpose lens will likely be your most-used landscape lens. The most useful range of focal lengths you should consider as part of your landscape photography kit are 16-300mm for a full frame DSLR and 10-200mm for an APS-C/1.6x FOVCF format DSLR. The focal length of the lens is of primary importance, but the max aperture it has is (usually) not. 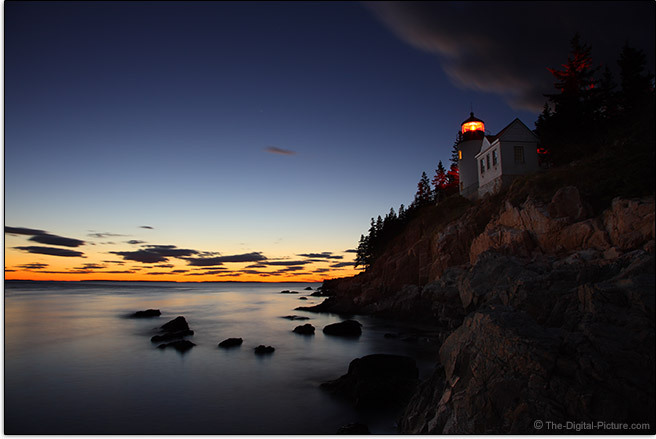 While a wide aperture can be used to isolate a detail in the landscape or to capture the night sky, much landscape photography is done using small apertures for a desired large DOF (Depth of Field). Therefore, landscape photography does not need the fastest (widest aperture, heaviest weight, most expensive) lenses. What is needed is high resolution. Landscape subjects typically have extremely fine detail and these subjects will push camera and lens resolution requirements up high on the needs list. Lenses need to be sharp enough to show tiniest details. Landscape photography often requires travel to get to the ultimate landscape photography destination. When traveling by airline, you will want to keep your pack light. The same need applies when hiking to that special location. Packing light helps keep the photographer's energy up and that will allow him/her to better focus on capturing the desired image. So, light weight is a generally important feature for a lens in the landscape kit. Since landscape subjects are often motionless, image stabilization can be a huge benefit for a landscape lens. Even under full sunlight, I very frequently need IS to make shooting handheld successful, especially when using a circular polarizing filter (a mandatory part of the landscape kit). With this filter reducing the amount of light reaching the sensor combined with the wind typically found at some of the ultimate landscape locations ... I need the help of image stabilization for my f/11 handheld daylight photography. Since landscape subjects are often motionless, fast autofocus is not usually an important feature for landscape photography. I use often use autofocus when shooting landscapes, but waiting even an extra second for the lens to focus would seldom make a difference in my images (unless the wife and kids are waiting for me). Even manual focus often works well when photographing at narrow apertures. Landscape photographers often encounter bad weather and this inclement weather may or may not be expected. Those working around water may also have to deal with salt or fresh water spray. Having weather sealed gear is a definite advantage under these circumstances. In addition to using mostly weather sealed gear, I generally have rain covers or garbage bags with me to quickly cover everything should I need to. The prime or zoom lens decision is a rather big one for the landscape photographer. Generalizing, the biggest advantage for using a prime lens is ultimate image quality – primarily the sharpest corners, low (or no) distortion and the least vignetting. Blurry corners are usually not appreciated in landscape images. Distortion is typically the most noticeable when a flat line appears near the frame border and curved oceans just don't look right. Vignetting shows most readily with a solid color covering a sizable portion of the frame edge and corner and though a gradient blue sky color may be pretty, it is usually not desirable in a landscape image. A prime lens issue is that you need to buy and carry many lenses to adequately cover the focal length range of a single zoom lens. Frequent lens changes required by a set of primes will inevitably lead to increased sensor dust that will be impossible to overlook in areas of blue sky at f/11. The zoom lenses today have excellent image quality and they are my choice for a significant percentage of my landscape photographs. But, I often have both lens types with me and sometimes I carry cameras with both types mounted at the same time. While the following list is far from conclusive, I will tell you about some of my favorite and most-used landscape lenses. I will separate the APS-C/1.6x FOVCF-only lens recommendations from the full frame lens choices, but note that the full frame choices are often the best choices for APS-C format cameras also. Note that I highly recommend full frame imaging sensor cameras, with their excellent pixel-level image quality, for landscape photography. 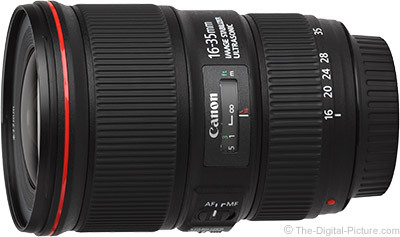 When I'm carrying one lens for landscape photography with an APS-C format DSLR, this is the lens I have with me. The 15-85 covers a wide range of most-important landscape focal lengths in a lightweight package. 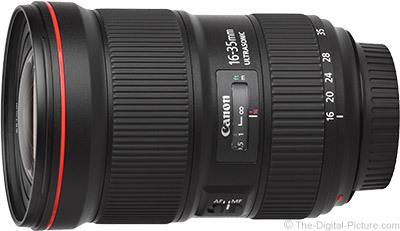 The Canon EF-S 17-55mm f/2.8 IS USM Lens is my close second choice, but the 17-55 is heavier with a shorter focal length range. You want the 17-55 if night skies are in your photos. 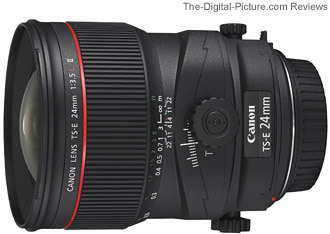 The Canon EF-S 10-22 is my APS-C choice for emphasizing foregrounds against and in-focus distant background. The look that 10mm allows is great. This is a relatively small, light lens that is easy to take with you. While this lens does not have optical stabilization or a wide range of focal lengths (falling short of my recommended range), it makes up for its shortcomings with excellent, across-the-frame image quality. The wide f/1.8 aperture will let you create great landscape blurs behind a sharp foreground subject. 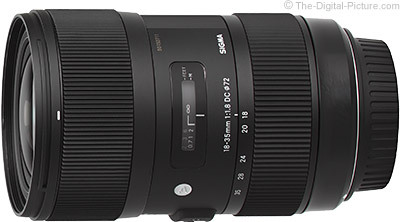 Sigma delivers very impressive physical features to accompany the excellent image quality you can expect from this lens. A vast range of focal lengths are useful for landscape photography and this lens alone features a very solid range of the most useful ones. 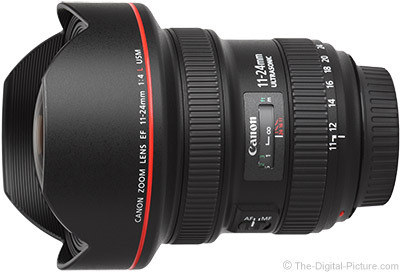 With very decent image quality anb a reasonable price tag, this lens delivers great value. 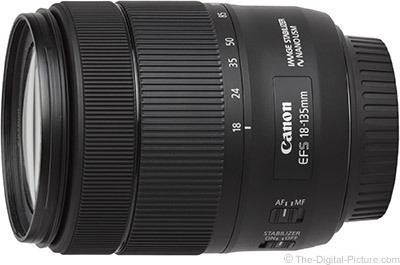 There are many reasons to select this lens for your primary landscape needs, but the 16-35mm focal length range, containing some of the most-desired landscape focal lengths, is one of the best reasons. Ultra-wide-angle through wide angle focal lengths allow large amounts of beauty to be taken in and are especially advantageous is that they permit both the foreground and the background to be kept in sharp focus. Another best reason and highly attractive for landscape photography is that this lens delivers really impressive image quality completely into full frame lens corners. The weather does not always cooperate with photographers shooting outdoors and this lens' weather sealed build quality shines under inclement weather conditions. The wide f/2.8 aperture, still providing reasonable landscape depth of field at these focal lengths, also shines under dark conditions and photographing the night landscape is another strong capability of this lens. 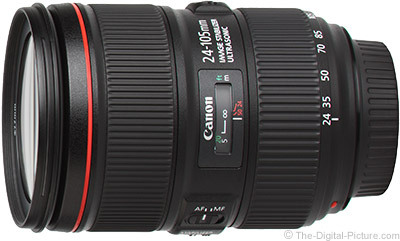 Take the characteristics of the Canon EF 16-35mm f/2.8L III USM Lens, reduce the aperture by 1/2 (from f/2.8 to f/4) and add image stabilization to get this lens. The reduced max-aperture provides reduced size, lighter weight and a very-attractive price. The addition of image stabilization greatly adds to the versatility of this lens and makes it even more desirable than the referenced f/2.8 version for many purposes including hiking without a tripod. 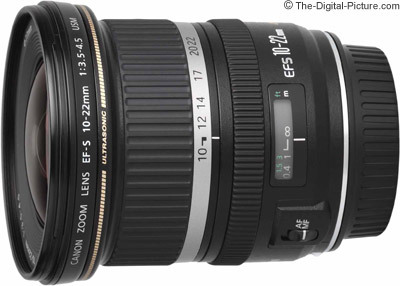 This lens is a solid choice for both amateur and professional landscape photographers. 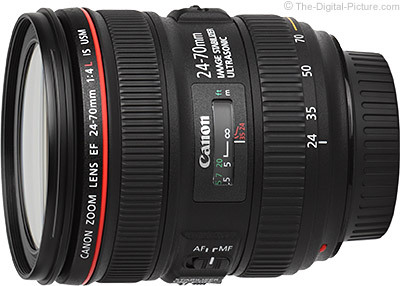 The 24-70mm is a very important landscape photography focal length range to have covered and this lens is the best-available option to cover it, especially from an image quality perspective. While this lens' extremely fast AF may not matter for your landscape photography purposes, its great AF accuracy surely will. Solid build quality including weather sealing are also important qualities for an outdoors lens and the 24-70 L II checks that box. The f/2.8 aperture will allow you to get more creative with subject isolation/background blur, but that extra glass does add to the carry weight of this lens. Landscape photographers will likely find image stabilization to be a desired feature that is missing. Shoot from a tripod and you will not need IS. With great image quality, a solid focal length range, light weight and image stabilization, the 24-70 f/4 ISL makes a great general purpose landscape lens. The biggest advantage this lens holds over the 24-105L IS and the rest of its competition is the impressive 0.7x macro focusing capabilities. 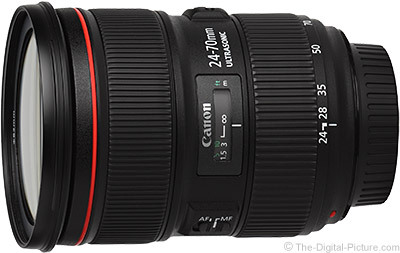 The 24-70L IS also has less barrel distortion than the 24-105L at 24mm, but the 24-70 IS costs more and has a shorter focal length range. 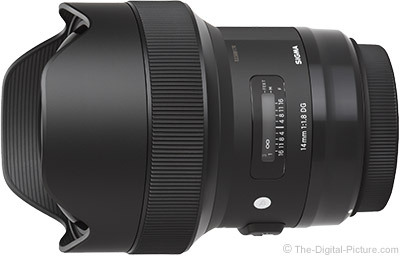 The 24-105 L II provides a nice extension to the 24-70mm focal length range and this lens again includes the often-important image stabilization. This lens' predecessor, the 24-105 f/4L IS Lens version I, was one of my most-used-ever lenses and this lens improves on the predecessor lens. While the optical improvements are not huge, the II has less distortion at 24mm, has a better IS system and features a better build quality. This is simply a great all-purpose lens. The 11-24 L goes wider than any rectilinear lens before it and this ultra wide angle of view can set landscape photos apart from the crowd. This lens delivers very impressive image quality performance over its entire focal length range and its pro-grade build quality is ready to go wherever you take it. Downsides: price, weight and inability to mount a circular polarizer filter. Landscape photography, for me, often involves the use of telephoto focal lengths and creating great telephoto landscape images is sometimes so easy that it feels like cheating. When those situations arise, the Canon 100-400 L II is my top choice. This lens is easily portable and handholdable, but features a very long focal length range that works especially well for wildlife encountered while photographing landscapes. The image quality from this lens is top-notch and the build quality matches. Landscape photographers always want great image quality and long focal lengths are often needed for this pursuit. This lens avails those the focal lengths that renders distant subjects, such as mountains, large in the frame. In this case, great image quality comes in a light and compact (relatively speaking) package that will also be appreciated. Those working on a tripod will miss having a tripod foot for this lens, but the great-value price will be found compensatory. 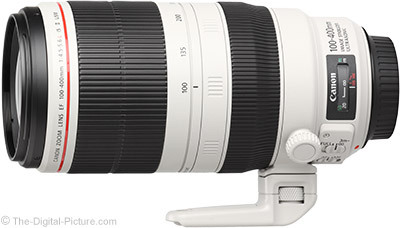 The 70-200 f/4L IS II does not have the focal length range that the 70-300L IS has, but the 70-200 is another excellent telephoto landscape lens choice. Focal lengths beyond 200mm are often not needed and the 70-200's lighter weight is especially welcomed when hiking. 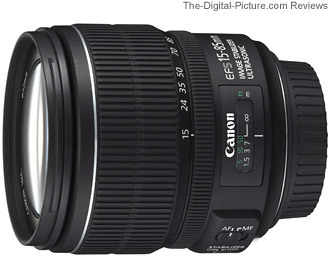 This lens has impressive image quality and is built for professional use. The Sigma 14mm Art lens is aesthetically beautiful and the images it creates are the same. One of the most attractive features of this lens is the extremely wide f/1.8 aperture, allowing this lens to keep working right through the night, capturing some of the best-quality night sky images you have seen. This lens is not compatible with front filters. This Lens has the Moves! Solid build quality and tilt, shift & rotation movements in an ideal-for-landscapes 24mm focal length gives you an overall awesome landscape lens choice. This is a manual-focus-only lens and no Canon TS-E lens is currently weather sealed. Visit the Canon Lens Recommendations page for more recommendations. The best landscape lens needs the Best Landscape Camera – check out our recommendations.